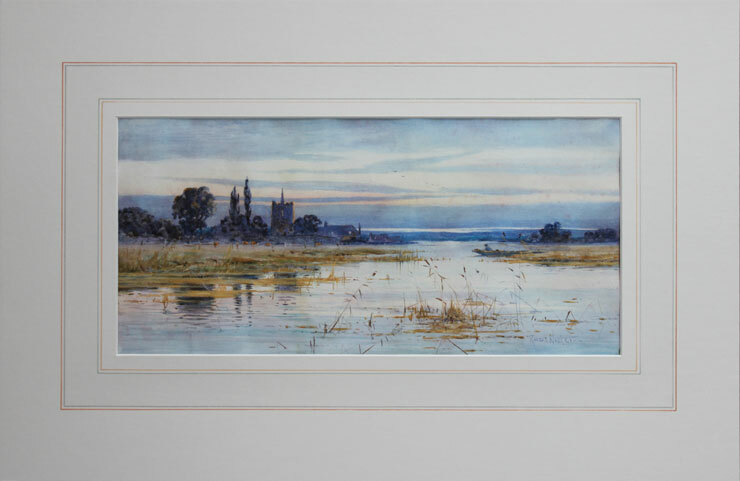 A watercolour, probably a Norfolk scene, signed Robert Winter restored and conservation mounted for a client in London. The original card mounting shows classic staining caused by condensation leaching through gaps in the frame's backing board carrying resins from the rough timber joins and gaps around the picture frame. 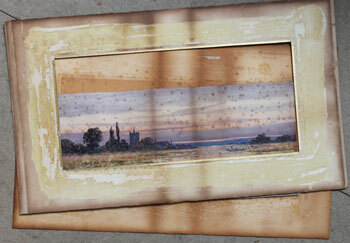 The card and aperture mount, also made from wood-pulp, exacerbated this effect as damp and resin reacting with the glue used to mount the watercolour. Mildew formed around particles of dust and impurities on the paper surface creating reddish-brown spots known as "foxing".